Grant Cohn of the Santa Rosa Press Democrat believes that offseason additions will prevent San-Francisco 49ers’ edge defender Arik Armstead from contributing on passing downs. This offseason the 49ers moved Armstead to base end to better fit their new 4-3 defense. Armstead had a disappointing sophomore campaign filled with injury and regressed level of play earning a low 44.1 overall grade ranking 93rd out of 127 interior defenders. As a rookie, Armstead earned an 80.8 overall grade and ranked 26th at his position. 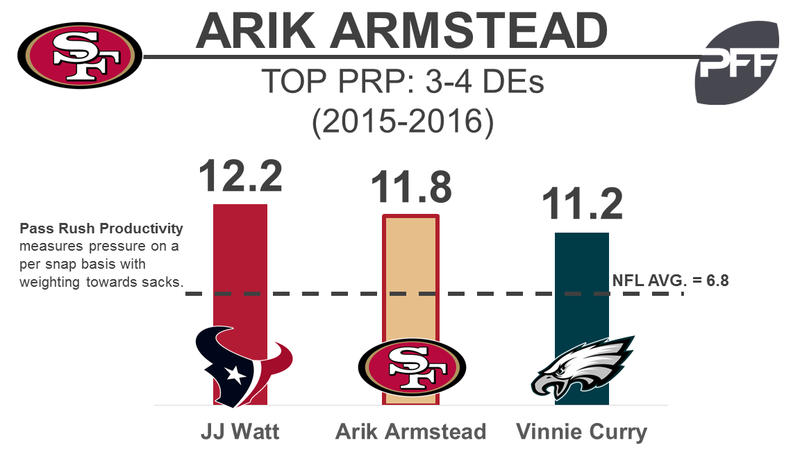 Armstead has shown to be very effective rushing the passer, leading all 3-4 defensive ends in pass-rush productivity each of the past two years at 12.3 in 2015 and 11.2 in 2016.